Born and raised in Arlington Heights, I began piano lessons in first grade. I continued with lessons all through college, but I also participated in other areas of music. I started trombone in fourth grade and continued with band all through college. I started guitar in eighth grade and was part of Saint Viator High School's jazz band. I also took drum set lessons for a short period of time in high school. I attended Elmhurst College and graduated with a degree in music education and a certificate in piano pedagogy. Although I am certified to teach K-12 music in any public school in Illinois, I decided to continue in growing my private studio after college in order to work with students on a one-on-one level. I studied under Linda Camp and Wendy Unrath-Young during my time at Elmhurst College. I would also like to attribute my strong background in music theory and ear training to another Elmhurst College professor, Kevin Olson, whose beginner piano method books I use in my studio today. 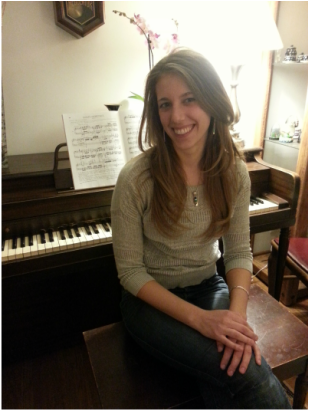 I have performed in numerous recitals, was a featured soloist with the Elmhurst College Chamber Orchestra, have accompanied for high school choirs, accompanied several solo and ensemble contests with local schools, and am a substitute pianist at a few local churches. Aside from my private studio, I also work with the Northwest Special Recreation Association (NWSRA) and teach students with special needs piano and guitar lessons. I teach students with special needs from all over the Chicago area in both my home studio as well as NWSRA.